Employers want to know about your accomplishments. They want to know, in addition to your academic success, what kind of activities you’ve been involved in and how these experiences matter to your professional development. It’s very important that you keep track of what you’ve been up to and Career Services will help you do that with a Grad Plus transcript. 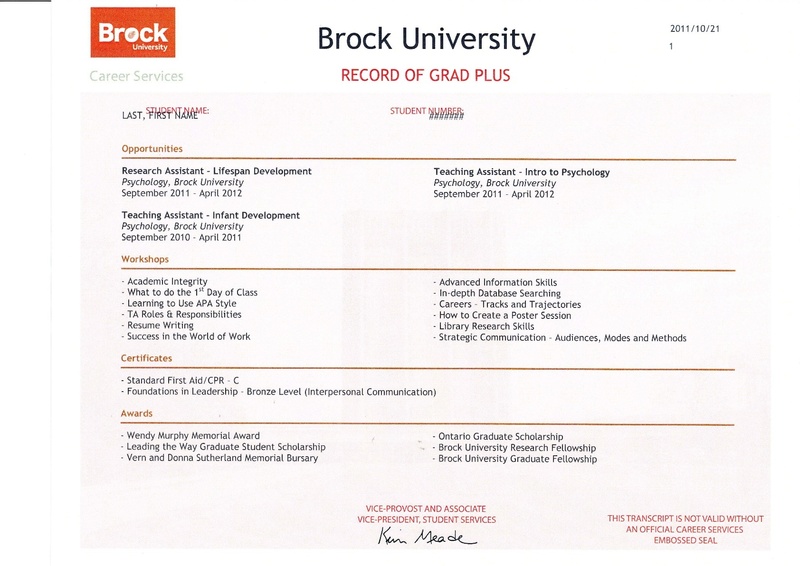 The Grad Plus transcript is an official Brock University document that showcases your “co-curricular” accomplishments — how and where you’ve spent time outside of your academic work to broaden your skills. You’ll find that having an official record of your activities is a must-have document as you look ahead to your professional life. And, if you are applying for funding and scholarships or to continue with post-graduate studies, you can put the transcript to work even sooner. Creating a Grad Plus transcript is easy. You can set it up in no time at all. Career Services has the steps outlined on its website as well as information on how to continue updating your GradPlus records, how to request copies of your transcript and how to use a Grad Plus transcript as part of a job search. A Grad Plus transcript is the best way to keep track of a busy graduate student career. And, it’s the best way to have everything ready to present as a showcase piece for your academic and professional portfolio.